A Labour government would give more support to British renewable energy companies, shadow business secretary Rebecca-Long Bailey has said. The Conservatives had undermined the green economy by scrapping projects such as the Swansea Bay tidal lagoon, she said. Labour leader Jeremy Corbyn last month launched a campaign to build more things in Britain after Brexit. 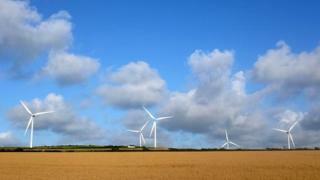 The government said it was "absolutely committed" to green energy. Labour says its policy of nationalising the energy sector would deliver renewable power and help consumers - but the Tories have said the plan would cost taxpayers money and result in a poorer service. Ms Long-Bailey, who is visiting wind turbine manufacturer Hutchinson Engineering, in Widnes, Cheshire, on Monday, attacked the Conservatives' record on green energy schemes, the scrapped carbon capture and storage initiative, and cuts to solar subsidies. "Our expensive and polluting energy system is reaching its sell-by date, with investment falling and millions in contracts going overseas," the shadow business secretary said. "At every turn, the government has undermined the energy industry and our green economy, scrapping big renewable projects, and the innovative expertise and jobs that come with them. "Labour will build an energy system that actually delivers for businesses, workers and our environment, creating secure and high-skilled jobs, while at the same time ensuring that 60% of our energy comes from zero-carbon or renewable sources by 2030." Department for Business, Energy and Industrial Strategy figures show that total greenhouse gas emissions have dropped by 41% between 1990 and 2016. A spokesman said the UK had established itself as "one of the world-leading nations in renewables and investment in low carbon technology". "We are absolutely committed to ensuring our renewables sector continues to thrive through our Clean Growth Strategy and modern Industrial Strategy and by 2021 we'll have invested over £2.5bn in low carbon innovations," the spokesman added. "To ensure our renewable sector can continue to grow we have provided industry with the certainty they need to invest in bringing forward new projects by setting out a clear timeline for future contracts for difference auctions and through our commitment to provide up to £557m of annual support." Conservative Party Chairman Brandon Lewis said: "Labour's plans to renationalise the energy network would cost tens of billions of pounds, which would be funded by hardworking taxpayers."